February | 2011 | Katie Simpson Spain (say it again). An art auction event funding the establishment of the Switchyard Community Gallery. 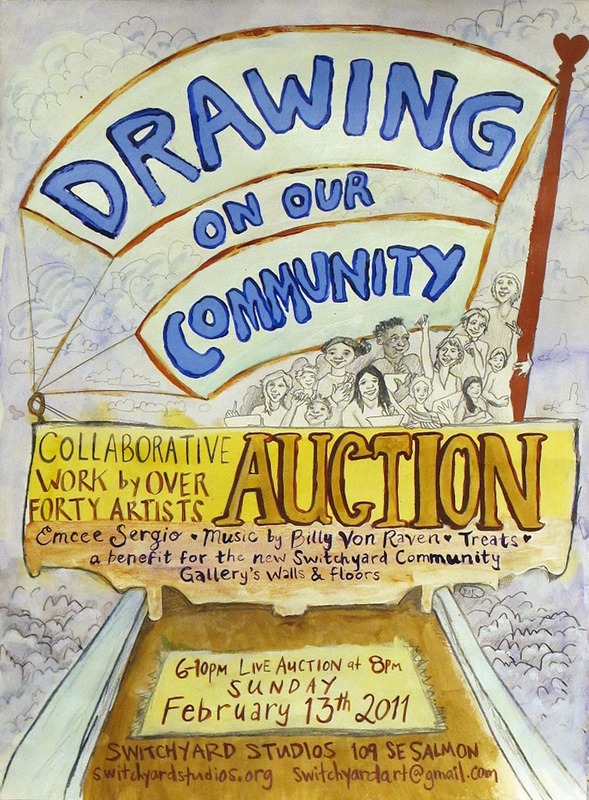 Throughout January and February Switchyard Studios artists and collaborators draw on the theme of the loving and vital interdependent relationship within an arts community, and then auction the drawings to create a dynamic new space for the community. Sunday February 13th in the Switchyard Gallery collaborative and individual pieces will be sold in a silent and live auction and given away in a drawing. Entertainment and refreshments will abound. La Sergio will preside as Master of Ceremonies. Performances by Billy Von Raven and others. Proceeds will fund the construction of the Switchyard Gallery walls and the laying of an earthen floor in the Switchyard Gallery and Community space. Participant member artists (The trains in our yard): Aiden Koch, Amelia Pillow, Amie Legette, Amira Mednick, Casey Burkhart, Courtney Keene, Curtis Williams of North Star Bags, Damon Ayers, David Knox, Emily Jones, Gabe Weiss, Heather MacKenzie, Jaik Faulk, Jeremy Davis, Johanna Robinson, Joshua Klyber, Kati Green, Katie Simpson Spain, Katie Todd, Lindsay DeArmond, Michelle Erickson, Michele Maule, Molly Jochem, Natalie Jenkins, Nicholas Bottman, Paul Maziar, Rachael Sabin, Rebecca Shelly, River Darensbourg, RJ Beus, Rochelle Koivunen, Ruth Hoffheimer, Sarah Hendrickson, Sarah Mikenis, Sarah K Small, Susan Sullivan, Virginia Driscoll. Community Collaborators: Emily Nachison, Esther Yan, Michael Endo, River Darensbourg and others. Portland artist Rochelle Koivunen founded Switchyard Studios in November 2008, which she now co-directs with Heather MacKenzie and Katie Simpson Spain. Switchyard provides affordable arts community work and exhibition space within a 10,000 square foot warehouse on the railroad tracks in industrial SE Portland. Switchyard contains a community workshop, the Switchyard Gallery, the individual spaces of over 35 artists and has served more than 60 artists in the past two years. The mission of Switchyard Gallery is to be a community resource providing exhibition and event space, education, and mentoring to artists of diverse levels of experience, philosophies, walks of life, abilities, and identities. The Gallery, once completed, will invite Portland curators, artists, activists and educators to collaborate with each other in creating a dynamic exhibition roster. The political, emotional, theoretical, abstract and critical needs of the greater Portland community will be met by a curatorial focus on consciousness-raising and community-building installations, events/happenings and workshops. The Switchyard Gallery will be based on collective business and decision-making models and will collaborate with artists in the process of creating, publicizing and documenting exhibitions. Switchyard n a railroad yard or terminal in which railroad cars are moved between tracks and trains are assembled and disassembled.